One of the most important aspects of website navigation is “user experience.” According to Norman and Nielsen, user experience, “encompasses all aspects of the end-user’s interaction with the company, its services, and its products.” The average user undoubtedly takes this for granted as they glide effortlessly from one webpage to the next until they stumble upon a website that is poorly designed, aesthetically unappealing, or difficult to navigate. This extends to web search interfaces as well. Confronted by the sheer diversity of users from all walks of life, web search interface designers have had to maintain a simple model to minimize the chance of confusion for their diverse users. As Hearst astutely observes, the design and arrangement of search result listings have undergone very little change over time. The example of the juxtaposed images of Infoseek listings from 1997 to those of a 2007 Google query demonstrates this assertion. In comparing the latter to today’s search interface, it is apparent that little has changed over the course of the last decade as well. While search user interfaces have changed little from that original simple format, the search engine industry has evolved drastically. While user experience may have prevented any major transformation of search user interfaces, that same factor has been a catalyst for change among competing search engines. Several companies rose and fell as a response to users’ perception and experience with their search engines over the course of the 1990’s and early 2000’s. The early turbulent career of the classic Ask Jeeves website provides an insightful study into the power and influence of user experience. Ask Jeeves was a search engine launched in 1996/97. The website was personified through a middle aged, balding butler named Jeeves. Though the search engine’s founder Garrett Gruener denies any connection, it is widely accepted that cyber Jeeves was inspired by the valet who appears in several books written by British author P. G. Wodehouse. Over the next few years, the website enjoyed a meteoric rise. When the company went public, stock prices started at $14 a share. That price soared to $190.50 per share. The company capitalized on its icon by using Jeeves to raise awareness about their information service. This included featuring the affable butler as a float in the annual Macy’s Thanksgiving Day parade and producing a variety of promotional products with his congenial expression. The search engine soon became one of the top 25 most trafficked sites in 2000. Despite its initial success, Ask Jeeves was not destined to dominate the internet in the 21st century. For starters, the Wodehouse estate argued that the website’s icon infringed on copyright law. Both parties reached a non-disclosed settlement in 2000. By the end of the year, however, Ask Jeeves was in serious trouble. There are multiple theories about the website’s rapid decline. TheStreet staff reported that the company was a victim of the search engine wars of the early 2000’s. Rossen, however, asserts that the company was one of many that took a hit when the dot-com bubble bust in 2001. In the end, the company was spared the indignity of going under. A new CEO was named, drastic cuts were made, and the company reported a profit in 2003. In 2005, InterActive Corp (IAC) purchased the company/website and rebranded their new investment as Ask.com. There seems to be merit in both of these theories that help explain the roller coaster ride of success and failure for the company. Yet, examining the rise and fall of Ask Jeeves through the lens of user experience will help bring the fate of Ask Jeeves into clearer focus. We can better understand the company’s tumultuous start through the website’s use of natural language, the personification of the website through its icon, and its overall effectiveness as a search engine. First, it is important to understand that Ask Jeeves was not always a general search engine. The company began as a question answering service. Prior to the launch of the website, Gruener and his team prepared a library of answers to questions they believed would be the most frequently asked. The website was designed for users to employ “natural language” in the form of asking questions (e.g. “How to get rid of skunk smell?”) in order to obtain answers to the information they sought. In 2018, users still overwhelmingly use Google by asking the service a question in natural language. Gruener’s natural language format may very well help explain why Ask Jeeves had a million searches a day by 1999. Personifying the website through the iconic Jeeves was another user experience factor that contributed to the company’s early success. It is important to remember that in the late 90’s, surfing the internet and using search engines were very new and foreign concepts to most people. Adding the dutiful, eager butler provided a very human element to the face of a search engine. Allowing people the opportunity to “ask” a question to a welcoming, friendly face was more appealing than typing a specialized string of words into one of the other impersonal search engines of the time. “Kung-Fu Jesus” suggested that the search engine did a poor job of providing relevant information at the top of its results list. He elaborated that, “Jeeves has an annoying tendency to hide the most popular and information-filled results several pages back while giving you fanboy websites and advertisements that merely mention the subject first.” “GirlSkater” suggested that users, “can’t get a straight answer from [J]eeves.” “Cloud” declared Ask Jeeves the “lamest Search Engine Ever.” Both “Cloud” and “The All Knowing Amy” argued that Ask Jeeves was not as efficient as Google. The fact that these four contributors have received a combined total of over 1,100 votes in favor of their definitions demonstrates that Ask Jeeves had more than a few critics. For all of the his charm, the internet’s favorite butler frequently failed to deliver to his users. It is clear that Ask Jeeves took a beating from the dot-com bubble collapse. Ask Jeeves reported a staggering loss of $425 million in 2001. In 2002, company shares were a mere 86 cents. The dot-com crisis alone, however, does not explain Ask Jeeves’ fall because the company was on the rebound by 2003. The key to understanding the website’s transition from being one of the internet’s most trafficked websites to one of its more relatively obscure search engines is recognizing the fallout from the search engine war. In 2012, the company’s CEO threw in the towel and declared Google the victor. The search engine war was lost, at least in part, because of Google’s superior user experience. As illuminating as the Urban Dictionary entries are, statistical evidence reinforces this theory. In 2003, Google dominated the search engine market with 32%. Ask Jeeves had a meager 3%. By 2012, the gap had widen even further. In September of that year, Google controlled 66.7% of the market compared to Ask.com’s 3.5%. Over time, more and more people chose Google over Ask Jeeves because the former had a superior user experience. *Reader discretion is advised when perusing this page as there is a liberal use of profanity and sexual innuendos. 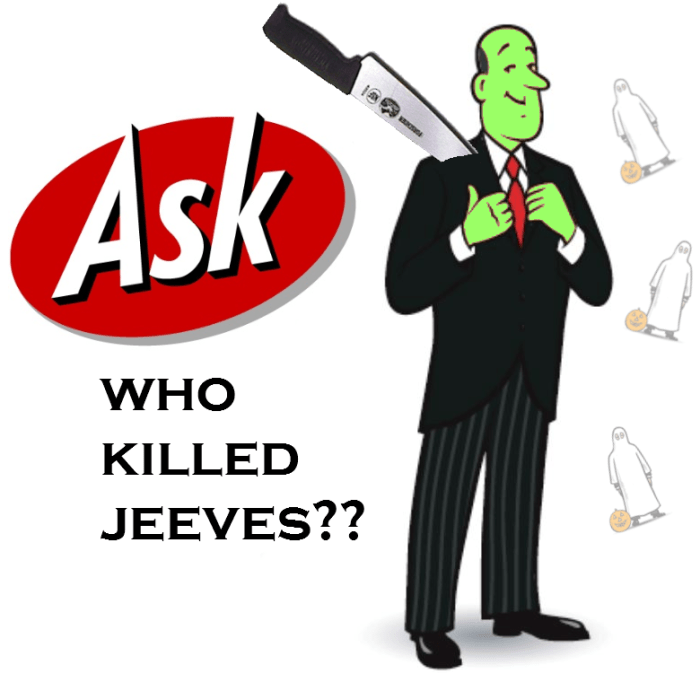 In 2005, InterActive Corp (IAC) bought the Ask Jeeves website for $1.85 billion. Under this new management, the website’s name was changed to Ask.com. Despite this leadership change and rebranding, Ask.com failed to regain its former glory. With the writing on the wall, Ask.com announced in 2010 that it would abandon its quest to dominate the search engine industry and return to its roots as a question answering service. The iconic Jeeves evolved with the company he symbolized as it responded to changing circumstances. In 2004, the butler was removed from the website temporarily for a “world tour” and reappeared with a slender figure. On April 1, 2005, the butler made his debut as the Jeeves 9000 robot. Did these redesigns perhaps reflect the company’s optimistic hopes for the future? Did slender Jeeves symbolize a leaner company poised to recover its momentum after emerging from its earlier setbacks? The obvious light-hearted April Fools Day shenanigans aside, was Jeeves 9000 a wishful vision of the company’s future as an innovative search engine industry leader in the new millennium? We can only surmise. With ownership of Ask Jeeves transferred to IAC, speculation arose concerning the butler’s job security. When asked about the future of the icon in August 2005, CEO Steve Berlowitz stated that Jeeves was “safe for the moment.” IAC’s Barry Diller, however, had other plans. The following month, he announced that the website’s icon would “retire.” Why? To rebrand and improve the website for user experience. The new owners of the company believed that Jeeves was a throwback to the 90’s that was no longer an effective marketing tool. In his own words, Diller teased that he didn’t “see many tears on the floor” over this decision. After spending nearly a decade serving internet users, the aging butler disappeared from the website in 2006. Branding consultant Rob Frankel described Jeeves as a relic of the “playful, early days of the Internet.” This is an intriguing observation because it shows how an icon’s appeal to users can change over time. When Jeeves first appeared, he provided a welcome, “familiar face” for users who were new to the internet and search engines. This human element that the icon brought to the world of search engines, however, could not make up for the imperfect service provided by Ask Jeeves. This unreliability resulted in negative user experience, which in turn ultimately drove many into the arms of faceless search engine competitor Google. Aside from some brief reappearances since 2006, Jeeves remains retired. We wish our former internet butler well on his well-earned rest.